MAL-GRIT XTRA Heavy-Duty Stripping Brush - 46 Grit, 10" Dia. MAL-GRIT XTRA Heavy-Duty Stripping Brush - 46 Grit, 11" Dia. MAL-GRIT XTRA Heavy-Duty Stripping Brush - 46 Grit, 12" Dia. MAL-GRIT XTRA Heavy-Duty Stripping Brush - 46 Grit, 13" Dia. MAL-GRIT XTRA Heavy-Duty Stripping Brush - 46 Grit, 14" Dia. MAL-GRIT XTRA Heavy-Duty Stripping Brush - 46 Grit, 15" Dia. MAL-GRIT XTRA Heavy-Duty Stripping Brush - 46 Grit, 16" Dia. MAL-GRIT XTRA Heavy-Duty Stripping Brush - 46 Grit, 17" Dia. MAL-GRIT XTRA Heavy-Duty Stripping Brush - 46 Grit, 18" Dia. MAL-GRIT XTRA Heavy-Duty Stripping Brush - 46 Grit, 19" Dia. MAL-GRIT XTRA Heavy-Duty Stripping Brush - 46 Grit, 20" Dia. MAL-GRIT XTRA Heavy-Duty Stripping Brush - 46 Grit, 21" Dia. Replacement Floor Machine General Purpose Scrubbing Brushes. If you know your machine make & model, we suggest you visit our Manufacturer/Brand Specific Equipment Reference List section or if you cannot find what you're looking for, please call us toll FREE 1-224-654-6500 and a sales representative will happily assist you. MAL-GRIT™ rotary floor machine brushes offer solutions to a wide range of cleaning situations. Silicone carbide impregnated nylon bristles are self-replenishing as brush wears, offering unmatched value that outlasts floor pads over 100 to 1! That translates directly into time and cost savings. Featuring our water and chemical resistant TUFF-BLOCK® for maximum life expectancy. All Grit Brushes must be run in a wet environment. 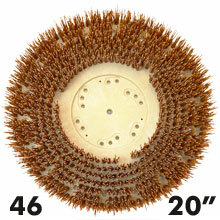 CLEAN-GRIT™ - An excellent general scrubbing brush for frequent maintenance cleaning. Flexible enough for cleaning narrow grout lines and uneven surfaces. MAL-GRIT™ - Our most popular grit brush. An aggressive brush for general scrubbing or stripping finishes from hard surfaces. Effectively cleans wide grout lines. MAL-GRIT LITE™ - Offers the durability of grit brushes with minimum aggression. For daily scrubbing of a variety of tiles, marble, terrazzo and non-slip epoxy finishes. MAL-GRIT SCRUB™ - 120 Grit Brush meant for General Scrubbing purposes. MAL-GRIT XTRA™ - The most aggressive grit available. This heavy gauge nylon with larger grit is used for stripping heavily soiled floors, such as concrete floors, in an industrial setting. There are several simple questions that should be asked in order to provide the proper brush for the cleaning application. A pad driver or MIGHTY-LOK™ should be 1" smaller than the machine size. Block Diameter: Lay the brush on the bristles, block side up. Measure the actual outside diameter of the block (not the bristle flare). See photo below for reference (measurement B). Center Hole Diameter: Lay the brush on the bristles block side up. Remove mounting hardware, if any. Measure actual inside diameter of the center hole. See photo below for reference (measurement D). 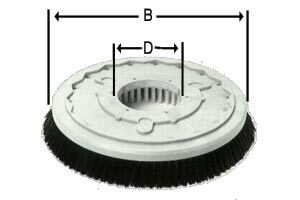 Once the correct size of brush and the proper clutch plate is determined, a few questions will enable you to select the correct type of brush or pad driver that is needed to fill your needs. NOTE: Malish brushes are designed to fit each machine as shown, even though the block diameter listed on the charts may vary slightly from the diameter of the block originally supplied with the machine. What is the make and model number of the machine? When you have this information, please proceed to the Manufacturer/Brand Specific Equipment Reference List section of this web site. The machine manufacturers are listed in alphabetical order. Once your brand of machine is found, continue down until you find the correct model. By reading across, you can then determine the proper brush or pad driver size as well as the correct clutch plate. Click here for floor machine equipment reference guide. When calling customer service toll FREE at 1-888-226-2724, please have the machine manufacturer and model number to help determine the block size, center hole diameter and clutch plate necessary to attach the block to the machine. If the machine size is not apparent from the model number, please provide this specification. Before using a new brush on carpeting, the brush should be broken in according to the following directions. This will eliminate possible excess drag by “tipping” the strands, removing any possible burrs caused by the manufacturing process. Mount the brush on the floor machine. Follow ALL instructions included in your owner's manual. Find a rough textured floor surface, preferably unfinished concrete. Operate the machine on this surface. Run the machine DRY for approximately 15-20 minutes. The brush fibers will take a slight set or lean in the direction of machine rotation. Rinse the brush to remove any dirt caught when running machine. The brush is now ready to be used on carpeting.